All 2008 GS models will feature a revised front-end, with a new bumper, deeper intakes, and a subtly changed chrome grille. Other exterior changes: The alloy wheels have been redesigned, and turn signals have been integrated into the side mirrors. The interior has a new color and trim option, and the instrument panel has been revised. A VDIM cutoff switch has been added, allowing the driver to disengage the stability system. The GS 460 will be sporting a 342hp V8 engine (presumably from the UAE LS 460) and an eight-speed automatic transmission. The GS 450h will a few additional aesthetic tweaks: blue-tinted headlights and tail lights, blue front and rear logos, and a blue hybrid designation on the side rocker panels. From the photos, you can see the steering wheels has been changed somewhat, with a different button layout, and the shifter base is now chrome. Can’t really spot the changes in the instrument panel, though. August 29, 2007 – Torrance, CA – The Lexus GS 450h, first introduced in April 2006 as a 2007 model, remains the only hybrid-powered performance luxury sport sedan in its segment. Based on the new-generation GS platform and featuring Lexus Hybrid Drive technology, the GS 450h offers V8-like performance with greater fuel efficiency. For 2008, the unique GS 450h shares the front style refreshing of the GS 350 and GS 460 models, including revised front fascias with a new front bumper and lower intake design and a new chrome grille surround. All GS models gain side view mirror turn signals, and the GS 450h adds a hybrid-exclusive exterior color, Black Opal Mica, and also gains additional blue hybrid highlights. The 2008 GS instrument panel has been revised, and a new brushed-aluminum shift-plate surround and wood-trim door switch plates accentuate the interior elegance. New interior choices include light gray leather trim and dark gray wood trim. A VDIM cutoff switch has also been added to allow the driver to disengage the stability system when appropriate. With its advanced technology, high performance and indulgent luxury, the rear-wheel-drive 2008 GS 450h is the premium model in the GS series. In addition to the GS 450h, Lexus also offers the RX 400h luxury utility vehicle and the new-for-2008 LS 600h L flagship hybrid luxury sedan. In addition to boosting performance and fuel efficiency while lowering emissions, Lexus Hybrid Drive technology also further elevates the brand’s renowned smooth, quiet operation. The GS 450h’s unique version of the Lexus Hybrid Drive powertrain combines a powerful 3.5-liter V6 engine with a compact, permanent magnet electric motor – all driving the rear wheels. The hybrid powertrain collectively produces 340 horsepower and can effortlessly accelerate the GS 450h from zero-to-60 mph in just 5.2 seconds. Just as impressive as the GS 450h’s acceleration from a stop is how quickly and powerfully torque is delivered during mid-range acceleration. The hybrid system’s electric-drive motor delivers maximum torque immediately upon demand. This unique power-delivery characteristic is most noticeable, and most useful, during 30-to-50 mph passing and in traffic-merging maneuvers. The GS 450h returns nearly 30-percent better fuel efficiency than some V8 models, with EPA-estimated fuel economy of 22 mpg city/25 mpg highway/23 mpg combined. The GS 450h is certified as a Super-Low Emissions Vehicle (SULEV). The GS 450h matches its powerful acceleration with responsive handling while maintaining the ultra-comfortable ride that is synonymous with the Lexus brand. Double-wishbone front and multilink rear suspension systems endow the GS 450h with engaging handling performance. Like the V8-powered GS 460 model, the GS 450h is equipped as standard with Adaptive Variable Suspension (AVS), a driver-selectable shock absorber damping system. The standard 18 x 8-inch aluminum alloy wheels have a finish that is unique to the GS 450h and are equipped with 245/40R18 Z-rated summer performance tires; all-season run-flat tires are available. An optional Active Power Stabilizer system helps to further reduce body sway during cornering. The system uses an Electronic Control Unit (ECU) to calculate the force needed to counter excess body sway, which is then applied to the stabilizer bars by front and rear electric-powered actuators. The GS 450h also showcases the brand’s highest level of dynamic handling technology: the advanced Vehicle Dynamics Integrated Management (VDIM) system that goes beyond the capability of other stability and traction-control systems. VDIM is designed to anticipate the onset of a vehicle slide while cornering and then help to automatically correct the situation with a combination of braking, throttle and steering control in a way that is essentially transparent to the driver. VDIM integrates Electric Power Steering (EPS), Variable Gear Ratio Steering (VGRS), Antilock Braking System (ABS), Electronic Brake-force Distribution (EBD), Brake Assist (BA), Vehicle Stability Control (VSC), Electronically Controlled Brakes (ECB), and Traction Control (TRAC). A “full hybrid,” the GS 450h is capable of operating in gas-only or electric-only modes, or a combination of the two. One of a new generation of Lexus engines, the gasoline V6 uses a dual fuel-injection system that combines the benefits of direct injection with those of port injection, and an Electronic Throttle Control System with intelligence (ETCS-i). Dual Variable Valve Timing with intelligence (VVT-i) operates on the intake and exhaust valves to further enhance power and torque across a broad engine speed range. The GS 450h hybrid powertrain uses two motor-generators, MG1 and MG2 (the drive motor). Each performs specific functions and can operate as both a motor and a generator, although MG1 is used as a starter motor and provides no motive force. The engine-driven generator (MG1) can charge the battery pack or provide additional power to MG2 as needed. A 288-volt DC Nickel Metal Hydride (Ni-MH) battery pack is installed behind the rear seat area. The battery’s power is directed through a “boost converter” that can efficiently raise voltage to a maximum 650V DC. An inverter changes this to AC, providing its elevated power to the 147-kW electric motor, which turns as high as 14,400 rpm. The trunk also contains a 12-volt auxiliary battery that powers various vehicle systems, including audio and navigation. Power from the gas engine and electric drive motor (MG2) is distributed to the rear drive wheels via a planetary gear-type Electronically controlled Continuously Variable Transmission (ECVT). This special transmission, which eliminates specific gear ratios, features a two-speed torque-multiplication device that allows drivers to select from among three driving modes: power, normal and snow. “Normal” provides the smoothest operation and is ideal for city or suburban driving; “power” sharpens accelerator pedal response and “snow” mode softens accelerator pedal response making it easier to travel on slippery road surfaces. The ECVT consists of a motor generator, motive power-dividing mechanism, two-stage motor-reduction device, electrically powered oil pump and hydraulic control system. The two-stage torque-multiplication device varies the gear ratio in two stages by controlling a planetary gear and two wet brakes, similar to the way a conventional automatic transmission operates. This configuration allows the electric drive motor to operate in high or low ranges, with seamless transitions between the two. MG2 can therefore contribute power not just for acceleration, but at higher cruising speeds as well. The driver will not feel the GS 450h’s transmission doing its work but will be keenly aware of its benefits in the powerful and uncannily smooth acceleration and passing performance. Since the GS 450h is driven solely by its electric motors when starting, traveling slowly, and during low-load driving, the noise level is about half that of a conventional gasoline engine, enhancing the luxury experience. The GS 450h’s power-steering pump and air-conditioning compressor are electrically powered rather than engine-driven to reduce parasitic losses to the engine and thereby improve fuel consumption. This is necessary because the gas engine often shuts down – a fuel-saving benefit of the hybrid system – especially when the vehicle is stopped or driven slowly through traffic. Ultraviolet and infrared ray-reducing tinted glass on all windows helps to reduce demand on the air conditioner. A regenerative braking system further boosts system efficiency. When the vehicle is coasting or the brakes are applied, the electric motors function as generators, capturing kinetic energy that would normally be lost as heat through the brakes and transforming it into useable electricity to recharge the batteries. All Lexus GS models implement a wide array of advanced safety systems. The Supplemental Restraint System (SRS) includes variable-force front airbags for both the driver and front passenger. Sensors determine the severity of an impact and in turn the airbag deployment force, helping to provide an appropriate level of occupant restraint. The GS features standard seat-mounted side airbags for the front seats, knee airbags for the driver and front passenger, and front and rear side-curtain airbags. The optional Pre-Collision System (PCS) can help the driver to avoid an accident. A millimeter-wave radar sensor helps detect obstacles in front of the car, while vehicle speed, steering-angle and yaw-rate inputs help to determine whether a collision is unavoidable. In such a situation, PCS switches the AVS to sport mode for optimal chassis response, preemptively retracts front seat belts, and pre-initializes Brake Assist so that increased braking will be applied the instant the driver depresses the pedal. The active-braking feature will automatically apply the brakes up to a deceleration rate of 0.3 G’s if the driver fails to react to system warnings. The current generation GS sedans introduced the brand’s L-finesse design language. A 112.2-inch wheelbase, long hood, pulled-back cabin and short rear deck create a confident, powerful stance for the GS. A low 0.27 coefficient of drag (Cd) helps to maximize highway fuel efficiency and minimize wind noise. Subtle visual differences distinguish the GS 450h from other GS models. These include a blue hybrid designation on the side rocker moldings, aluminum-and-blue enameled rear model designation, special 18-inch light-alloy wheels, a Lexis Hybrid Drive engine cover, blue front and rear “L” logos, a blue tint to the headlamps and tail lamps and a power meter that replaces the tachometer. 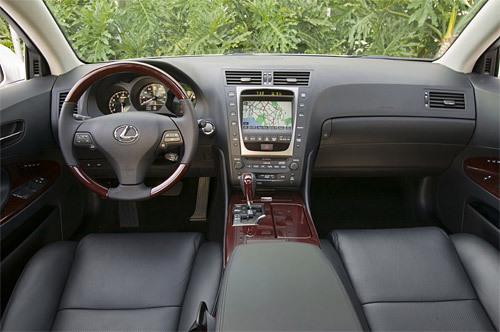 Ultra-premium wood, polished-metal accents and leather trim endow the GS interior with a lavish yet high-precision feel. Touch points convey quality, and controls respond fluidly. The three-pod analog instrument cluster features an Electro Chromatic Display and variable-transparency glass for high visibility in a variety of light conditions. Lexus designers strive to keep controls simple and intuitive, avoiding needless complexity. The SmartAccess keyless entry and push-to-start ignition allow the driver to keep the access fob in a pocket or purse. Audio and climate-control systems are easy to understand and operate, and the GS locates controls that are used less frequently behind a dash panel on the left side of the steering wheel. The interior presents an indulgent environment with regency leather-trimmed seats in Ash, Cashmere or Black leather matched with wood trim in Dark Gray Bird’s-eye Maple, Brown Bird’s-eye Maple or Walnut, respectively. The cabin is further enhanced with a wood and leather-trimmed three-spoke steering wheel – featuring audio and multi-information display controls – and a coordinating wood and leather-trim shift knob. The 10-way power-adjustable front driver and passenger seats are heated and ventilated, and there are height-adjustable headrests for all five seating positions. As the top model in the GS line, the GS 450h features the highest level of standard luxury equipment and includes features that are optional on other GS models: power rear sunshade; heated and ventilated front seats; rear-seat side airbags; rain-sensing wipers; rear back-up camera; headlamp washers, and the Adaptive Front-lighting System (AFS), which helps illuminate a curve as the driver steers into it. A power-tilt and telescopic steering wheel helps ensure a comfortable driving position. The standard dual-zone climate-control system filters the air, and a standard rear power sunshade adds to passenger comfort on warm days. The GS 450h includes the convenience of a power trunk closer, rain-sensing windshield wipers and Intuitive Park Assist (IPA), which uses ultrasonic sensors to detect the presence of objects close by and warn the driver of their proximity. Lexus long ago established an elevated standard for mobile audio performance, and the next-generation GS models uphold this tenet with a standard system that features an AM/FM/cassette stereo and a six-disc, in-dash CD changer. The system plays through 10 premium speakers, and an Automatic Sound Levelizer (ASL) maintains consistent sound levels at varying vehicle speeds. All styles of music come to life in the ultra-quiet Lexus GS interior with the optional 7.1-channel Mark Levinson® Premium Sound system. Featuring a total of 330 watts playing through 14 speakers, the system allows users to play both CDs and DVDs. DVD movies can be viewed on the color seven-inch touch screen when the parking brake is engaged. The optional Lexus Navigation System includes voice-recognition that allows the driver to enter a destination by voice command. The display screen features a high-resolution 800 x 480 pixel display in 32,000 colors. On-screen details are crisp and clean, and maps and roads feature 3-D shadow effects. The DVD-map database contains more than five million points of interest. The database for Chicago, Detroit, Los Angeles, and New York includes a building footprint display feature that can show graphic representations of buildings and structures to help the driver identify surroundings. System functions include multiple route calculations, route preview, simplified highway junction graphics, and a dual-map screen mode. Bluetooth® wireless technology allows the transfer of personal phone books to the navigation system, from which the driver can make hands-free phone calls via its touch-screen control panel. All new Lexus vehicles come with a 48-month/50,000-mile basic limited warranty with roadside assistance for 48-months/unlimited miles. Powertrain and restraint system coverage is provided for 72 months/70,000 miles. Corrosion perforation protection is covered for 72 months, regardless of mileage. The hybrid-related components, including the HV battery, battery control module, hybrid control module and inverter with converter, are covered for eight years/100,000 miles. August 29, 2007 – – Lexus has introduced the newest version of its GS luxury sport sedan range for 2008, the GS 460 with a new 342-horsepower 4.6-liter V8 and eight-speed automatic transmission. The GS 460 replaces the GS 430, providing more power and performance yet with similar fuel efficiency. Revised exterior styling details and enhanced interior luxury mark the GS range for 2008, which also includes the V6-powered GS 350 model and the only hybrid gasoline-electric in its segment, the GS 450h. The 2008 GS 460 offers some of the brand’s most advanced dynamic handling technology in conjunction with its new, more powerful V8 engine. The available Active Power Stabilizer system, for example, automatically and seamlessly counteracts body sway to improve cornering performance. The GS 460 can accelerate from zero to 60 mph in just 5.4 seconds. All GS models are distinguished for 2008 by revised front fascia styling, including a new front bumper and lower intake design and a new chrome grille surround. All models gain side-view-mirror turn signals, and all GS 350/460 models offer new wheel designs. Inside, the 2008 GS instrument panel has been revised, and a new brushed-aluminum shift plate surround and wood-trim door switch plates accentuate the interior elegance. New interior choices include dark gray Bird’s-eye Maple wood trim and new light gray leather trim. Optimized for low internal friction, the GS 350’s 3.5-liter V6 engine produces 303 horsepower at 6,200 rpm and 274 lb.-ft. of peak torque at 3,600 rpm. A direct fuel-injection system provides much finer fuel-mixture control to improve both power and fuel efficiency. Dual Variable Valve Timing with intelligence (VVT-i) acts on both intake and exhaust valves to further enhance performance through a wide rpm range. It uses a smooth-shifting six-speed transmission. The GS 460’s V8 produces 342 horsepower at 6,400 rpm and 339 lb.-ft. of peak torque at 4,100 rpm. The GS 460 is available as a rear-wheel-drive model and, like the V6 GS 350, achieves the EPA’s Ultra Low Emission Vehicle (ULEV-II) certification. Lexus has been setting standards for powertrain smoothness since its inception, and the GS 460’s new V8 and eight-speed transmission continue that tradition with even better rotational balance and reduced friction. The GS 350 and GS 460 both maximize performance with automatic transmissions that feature a sequential manual-shift mode. 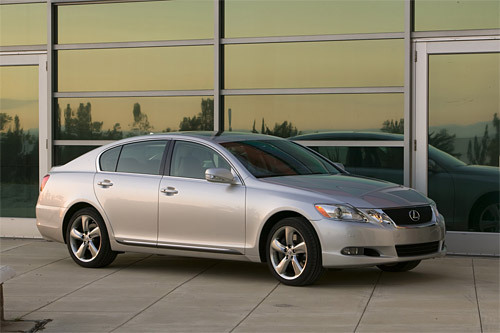 The 2008 GS 350’s available all-wheel-drive system helps to enhance handling in diverse driving conditions. A planetary-gear center differential and a wet-type multi-disc clutch control front-to-rear power distribution. The system normally sends 70 percent of available power to the rear wheels to provide the traditional performance advantages of a rear-drive car and will vary the torque-split ratio from 30:70 to 50:50 in response to driving conditions and driver input. The AWD system’s electronic-control strategy takes inputs such as steering and throttle angle from driver activity combined with vehicle signals from wheel speed and yaw rate sensors. The Lexus GS combines proven chassis systems with advanced dynamic handling technology. The double-wishbone front suspension and multilink rear suspension systems feature geometry optimized to virtually eliminate unwanted wheel-angle changes during suspension movement. The result is a natural, confident feel that’s also spirited. An Adaptive Variable Suspension (AVS) system, standard on and exclusive to the GS 460, provides four settings, including “sport” for tighter, more precise control. AVS can automatically select appropriate suspension damping for driving conditions. The GS 460 also offers the advanced Active Power Stabilizer system that reduces body sway and enhances vehicle control during cornering. This fast-acting system uses electric actuators, rather than slower hydraulic actuators used in most competitors’ systems. An Electronic Control Unit (ECU) calculates the force needed to counter excess body sway, which is then applied to the stabilizer bars by the front and rear actuators. The GS 460 provides the performance enhancements and advanced vehicle control of the Lexus Vehicle Dynamics Integrated Management (VDIM) system. VDIM integrates and manages a host of handling technologies more quickly than previous dynamic handling technologies could. Combining input from a variety of sensors, VDIM is designed to anticipate the onset of a vehicle skid or slide and then help correct the situation with a combination of braking, throttle, and steering control in a way that is essentially transparent to the driver. VDIM integration helps to provide precise management for the Electronically Controlled Brakes (ECB), Variable Gear Ratio Steering (VGRS), Electric Power Steering (EPS), Vehicle Stability Control (VSC), Anti-lock Braking System (ABS), Brake Assist (BA), Electronic Brake-force Distribution (EBD), and engine torque via the electronically controlled throttle. The GS also allows the driver to disengage the VSC and traction control via the “Trac Off” switch when the situation warrants doing so. Aluminum-alloy 18-inch wheels are standard on the GS 460 and available for the rear-wheel-drive GS 350. Electric Power Steering (EPS) in the GS 460 provides precise electric power assist using a DC motor built into the steering gear housing, rather than hydraulic assist. Eliminating the hydraulic steering pump reduces engine drag, and the simplified steering system is lighter, more compact and eliminates waste hydraulic fluid, as well. Also in the GS 460, Variable Gear Ratio Steering (VGRS) can vary the steering from 2.7 turns lock-to-lock for low-speed maneuverability to a slower 3.2 turns lock-to-lock for highway-speed stability. VGRS also provides differential steering control, which helps correct for a delay in steering response, something that occurs in all vehicles, to help enhance driving feel during lane changes and other transitional maneuvers. Enhanced braking performance in the GS sedans begins with mechanical components that significantly increase brake friction and improve stopping power, while effectively eliminating brake fade in normal driving conditions. Brake Assist (BA), Electronic Brake-force Distribution (EBD) and the Anti-lock Braking System (ABS) help form a powerful safety front. EBD optimizes brake pressure at each wheel to help minimize body dive or sway during hard braking and cornering. Brake Assist is designed to determine if the driver is attempting emergency braking and, if the driver has not stepped firmly enough on the brake pedal to activate the ABS, it will apply maximum braking force until pedal pressure is released. The GS 460’s Electronically Controlled Brakes (ECB) is a brake-by-wire system. ECB translates brake pedal pressure into electric signals that, via computer control, help provide precise and optimized braking. Electronic control provides quick brake response when needed, helping the GS 460’s VDIM system to anticipate and help correct skids before they occur. The ECB system is backed by conventional hydraulic brake control in the unlikely event of electronic failure. Lexus designers strive to keep controls simple and intuitive, avoiding needless complexity. The SmartAccess keyless entry and push-to-start ignition allow the driver to keep the access fob in a pocket or purse. Audio and climate-control systems are easy to understand and operate. New for 2008, the fuel filler door and trunk releases have been moved to a more convenient location on the dash. The unique instrument panel lighting system relies on variable-transparency glass to minimize reflections from the gauge faces and to help optimize visibility in all lighting conditions. A comprehensive interior lighting system provides just the right amount of light where the driver and passengers need it. All four windows offer one-touch up-and-down operation with jam protection. Both electrochromic auto-dimming side mirrors are power-retractable and feature automatic tilt-down to aid in parking when reverse gear is selected. A power trunk closer provides an added convenience on this extremely well equipped car. The Supplemental Restraint System (SRS) in the GS sedans includes variable-force front airbags for both driver and front passenger. The GS features standard seat-mounted side airbags for the front seats, knee airbags for the driver and front passenger, and front and rear side-curtain airbags. The optional Pre-Collision System (PCS) in the GS models can help the driver avoid an accident. A millimeter-wave radar sensor helps detect obstacles in front of the car, while vehicle speed, steering angle and yaw-rate inputs help to determine whether a collision is unavoidable. In such a situation, PCS switches the Adaptive Variable-air Suspension to sport mode for optimal chassis response, preemptively retracts front seat belts, and pre-initializes Brake Assist so that increased braking will be applied the instant the driver depresses the pedal. The active-braking feature will automatically apply the brakes up to a deceleration rate of 0.3 g if the driver fails to react to system warnings. The 2008 GS models provide multiple systems to help enhance driver safety and enhance the overall behind-the-wheel experience. The Adaptive Front lighting System (AFS), standard on the GS 460 and optional for the GS 350, helps illuminate a curve as the driver steers into it. A Tire Pressure Monitoring system can detect a critical loss in pressure in one or more tires and alert the driver. The available Intuitive Park Assist (IPA) system uses ultrasonic sensors to detect objects close to the car’s front and rear bumpers and alerts the driver accordingly. A steering-input sensor helps to better judge changes in distance to objects. The rear back-up camera, available in conjunction with the optional navigation system, automatically projects an image of what its lens can detect behind the vehicle onto the navigation screen when the vehicle is in reverse gear. The current generation GS sedans introduced the brand’s L-finesse design language. A 112.2-inch wheelbase, long hood, pulled-back cabin and short rear deck create a confident, powerful stance for the GS. A sloped, vertical grille surrounded by four independent headlamps visually connects the current GS sedans with the previous-generation models while signaling the brand’s design progression. The boldly styled lower valance features integrated fog lamps, and a low 0.27 coefficient of drag (Cd) helps to minimize wind noise. The passenger compartment is designed to be intimate without feeling confining. Ultra-premium wood, polished-metal accents and leather trim endow the GS interior with a lavish yet high-precision feel, with touch points that convey quality and controls that respond fluidly. The GS customer can choose from among three interior leather color combinations: Light Gray leather with Dark Gray Bird’s-eye maple wood trim, Cashmere leather with Brown Bird’s-eye Maple wood trim, or Black leather with Walnut wood trim. Each combination includes a matching wood and leather-trim steering wheel and shift knob. The GS sedans continue the Lexus tradition of providing luxury that envelopes the occupants without introducing unnecessary distractions. The standard Regency leather-trimmed, heated, 10-way power front seats (perforated leather trim on GS 460) are supportive and comfortably contoured for support on long trips. Ventilated front seats are standard for the GS 460 and available for the GS 350. A power-tilt and telescopic steering wheel helps ensure a comfortable driving position. The standard dual-zone climate-control system filters the air, and a standard rear power sunshade adds to passenger comfort on warm days. Lexus long ago established an elevated standard for mobile audio systems, and the GS models uphold this tenet with a standard system that features an AM/FM/cassette stereo and a 6-disc, in-dash CD changer. The system plays through 10 premium speakers while an Automatic Sound Levelizer (ASL) maintains consistent sound levels at varying vehicle speeds. Within the ultra-quiet Lexus GS interior, all styles of music come to life with the optional 7.1-channel Mark Levinson® Premium Sound system. Featuring 11 channels of amplification with a total of 330 watts playing through 14 speakers, the system allows users to play both CDs and DVDs. DVD movies can be viewed on the color seven-inch touch screen when the parking brake is engaged. The optional Lexus DVD Navigation System allows the driver to enter a destination by voice command. Visual support is greatly enhanced with a central screen featuring a high-resolution 800 x 480 pixel display in 32,000 colors. On-screen details are crisp and clean, and maps and roads include 3-D shadow effects. Text display options include English, Spanish and French, with the user able to select the language preference at system start-up. The DVD map database contains more than five million Points of Interest (POI). The database for Chicago, Detroit, Los Angeles, and New York includes a building footprint-display feature that can show graphic representations of buildings and structures to help the driver identify surroundings. System functions include multiple route calculations, route preview, simplified highway junction graphics, and a dual-map screen mode. Bluetooth® wireless technology integrates with the navigation system to allow the transfer of personal phone books to the navigation system. The driver can also make hands-free phone calls via its touch-screen control panel.